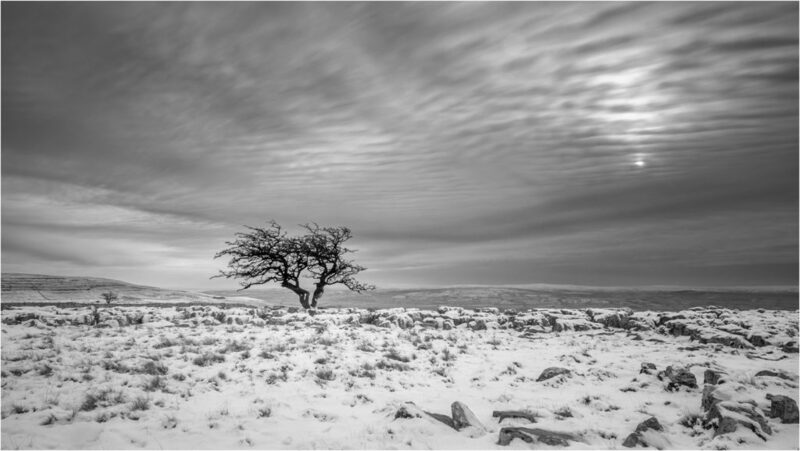 Twistleton Scar is located on the slopes of Whernside above Ingleton in the Yorkshire Dales. 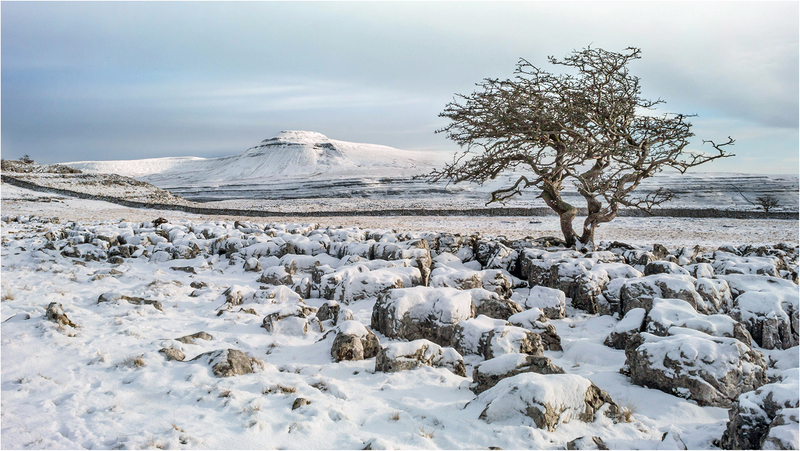 It is a limestone pavement with excellent views of Ingleborough, and has a few photogenic trees scattered about that give some excellent composition opportunities. This is a good location both early in the morning and in the evening, though it is a short half hour walk from the nearest parking spot. The main A65 route bypasses the village of Ingleton. 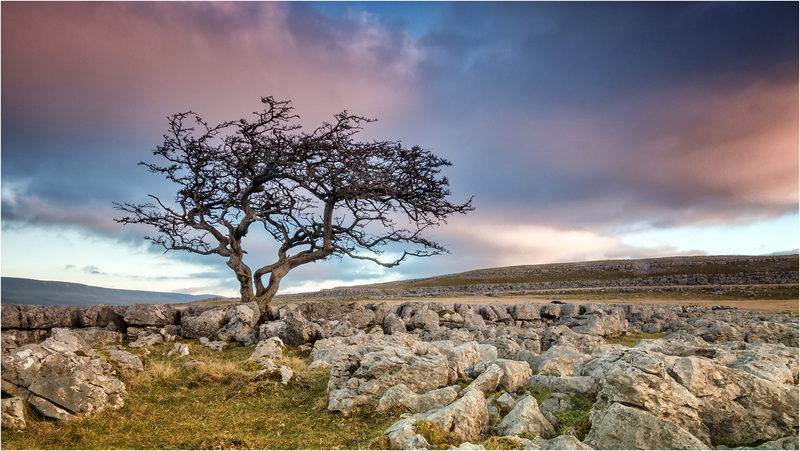 About 0.7 miles west of Ingleton, take the minor road opposite the junction with the A687. Called New Road, this is signposted to the Ingleton waterfalls. After a quarter of a mile, take the second turning on the left, which leads to St Oswalds parish church and a T junction after a further quarter of a mile. Turn right at the junction and climb Thornton Lane for 1.6 miles until a track turns off on the right. There is space here to park a few cars. 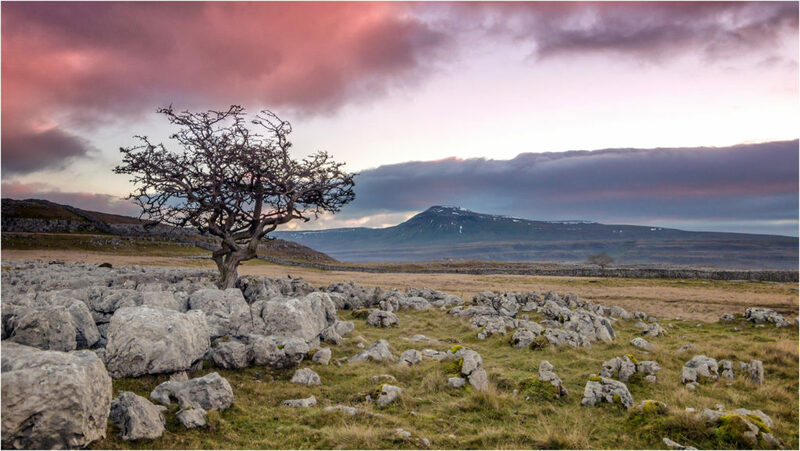 To reach Twistleton Scar, walk up the track, crossing the River Twiss by a footbridge and continue until the highest point of the track is reached. A small wooden post on the left marks the point where a path branches off and climbs the hillside in one long zig-zag until Twistleton Scar is reached. Twistleton Scar can also be reached as a diversion from the top of the Ingleton Waterfalls walk as the track mentioned above is used to cross from the River Twiss to the River Doe. Posted in Yorkshire and tagged Mountain.